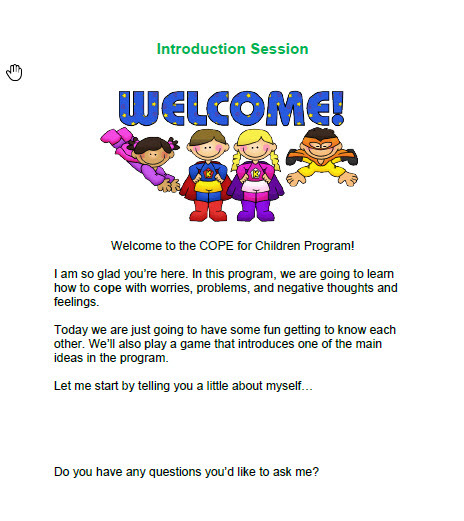 Program Details — COPE2Thrive LLC - Programs to help children and teens coping with stress, anxiety, depression. We offer all-inclusive programs (including instructor training and materials) delivered using standardized student manuals and concepts, ensuring that all components of Cognitive Behavioral Therapy are covered with patients/students despite any differences in a provider’s method of delivery. The 15-Session Healthy Lifestyles TEEN Program is designed for teens 13 to 18 years old and builds upon the skills learned in the 7-Session Program by including sessions on healthy nutrition and physical activity. Each 15-Session Program purchase gives instructors access to the 15-session and all 7-session manuals (sold separately). This program is provided to students using an instructor-delivered, hard-copy manual (online format is not currently available). Printed 15-session student manuals are $32 each. A Print-Your-Own Student Manuals option is now available for larger schools/districts/providers (minimum 200/type , i.e. 7-session, Children, 7-Session Teen, etc., student manuals and additional manuals must be purchased in groups of 200) that provides a 75% off savings off the printed manual price (contact us for further details). The 7-Session Child/Teen/Young Adult Programs are for children, teens and young adults 7 to 24 years old. These are provided to students using either an instructor-delivered, hard-copy manual format or a self-administered, online format (teen program only). Manual-based: $385/instructor for first year, annually renewable for $250, includes all instructor training and five manuals. Young Adults (ages 18 - 24) - instructor-delivered, hard-copy manual-based format. Printed 7-session student manuals range from $20 to $25 each. A Print-Your-Own Student Manuals option is now available for larger schools/districts/providers (minimum 200/type , i.e. 7-session, Children, 7-Session Teen, etc., student manuals and additional manuals must be purchased in groups of 200) that provides a 75% off savings off the printed manual price (contact us for further details). The instructor-delivered, hard-copy manual-based versions can be delivered individually or in groups in K-12 and universities, primary care practices, clinics, and healthcare systems in either brief 25- to 30-minute sessions or more traditional 50-minute class sessions. All instructor* training is online (no costly travel and hotel charges required) and is included in the price of the program package. Student hard-copy workbooks (manuals) are utilized in each program based upon the child's age group. Manuals are professionally printed and include a clear plastic front and sturdy black back cover. Each workbook is bound with a metal spiral coil binding that allows it to be laid flat and provide the student easy access to all pages. Students will be writing in the manuals and retaining them for future reference, so each student needs a separate manual. The same manual is used across all sessions of the applicable program. Printed student manuals range from $20 to $32 each. A Print-Your-Own Student Manuals option is now available for larger schools/districts/providers (minimum 200/type , i.e. 7-session, Children, 7-Session Teen, etc., student manuals and additional manuals must be purchased in groups of 200) that provides a 75% off savings off the printed manual price (contact us for further details). Instructors are independent service providers and have no affiliation with COPE2Thrive LLC. COPE2Thrive is not responsible for any issues associated with or resulting from instructors' delivery of the purchased programs. Program instructor training provides the buyer with general program background information, specific details of the program organization and content, and tips for delivering the program to the targeted audience. Completion of the instructor training and program licensing allows the instructor to utilize the copyrighted program for the term of the program delivery license. It does not provide the instructor with any legal, medical or educational licenses or certifications. The online, self-delivered 7-session program is a self-help, cognitive-behavioral skills-building intervention educational program only and is not meant to diagnose or provide treatment for a particular disease or illness. The goal of this educational program is to teach children and teens how to recognize negative thought patterns, and provide cognitive behavioral skills and techniques that can be useful in modifying negative thinking. * The online educational version does NOT require completion of the Instructor Training Course (required for manual-based program), so it can be purchased by anyone.